Leaving Oswiecim with a heavy heart im pretty much shattered yesterday was mentally draining but nothing in comparrison to those who suffered in Auschwitz. The next 30 miles or so were quiet and i entered a small town for lunch a pretty little town that i would have cycled past if i hadnt been hungry. I sat and eat my bread and cream cheese followed by a 50p enourmous cream cake and drank my tea watching the locals chatting away with hands in all directions while the girls in their little summer dresses teased the local boys. As i was leaving the square fuelled up and ready to go this man pulled up to my side on his bike and spoke polish,sorry welsh, oh I speak english, and we talked. 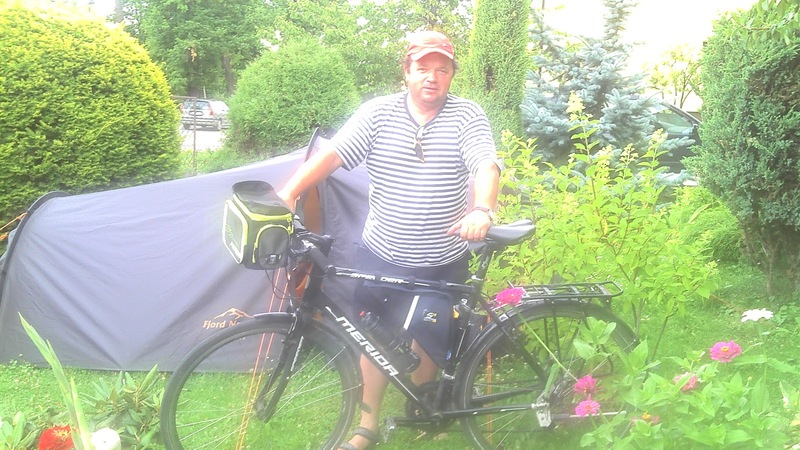 It turned out that he was off on a tour himself he was 50 and had decided to cycle to Croatia to meet up with his brother who was driving there. Looking at him he did not look like an athlete and i did wonder if he was up to it. He wanted to talk and with his cousin also on bike we went to a bar in the square where he bought me a cool beer. Time was ticking away and i was trying tohit he check border but something was telling me it was ok to wait. we carried on talking and he was looking for more information on touring. He was off to his sons house around the corner would i come for coffee and we talk more, hell why not, we went to his sons lovley appartment which i was warmly invited in met his son daughter in law and grandson philipp. Very kind people especially when you look from their eyes who the hell was I. After a while we had agreed that i would go with him on a little bike ride around his twn and to the bigest damn in poland that his father had worked on many years ago so the three of us cycled along in and around his town talking about our adventures ahead his cousin spoke no english and justkept smiling. we stopped at the impressive damn and headed off to have tea and cake paid by them they wouldnt let me pay, in a lovly little cafe he visits after his winter swi inyhe baths next door. we cycled on and he showed me more of his town a beautiful little garden he worked on when he wad a boy andthen onto his home. There i met his brother wife daughter son again father mother cousin and other members of his family he showed me his tent and cycle equipment and gave me food. I told him that he must drink lots of water and food to keep his energy levels up and when i said goodbye to him and his family i think he felt happier to go on his journey, and strange as it seemes he was good for me to i hadnt hit the border and there was no time leftin the day but my day with this man and his smiling cousin had given me something to smile about and i thank him so much for that. What a time you are having.. As you say yesterday must indead have been very thought provoking, and I would have thought mentally exhausting. Glad you met someone to cheer you today. Nice to know that there ARE good people out there. 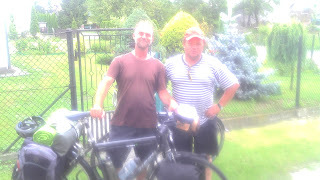 During my solo LEJOG, I really felt that it wasn't the journey but the people you meet along the way. There are always good people all around the world and being solo does make it easier to meet them. He sounds like a nice guy. I should think after the visit to the death camps it's exactly what was needed to reaffirm the greatness of human nature. Hope you met more along the way. Crikey Penny, you look like you've put weight on! When you're talking about 145 miles a day, you know it doesn't count if you're on a train eating massive 50p cakes? Sounds like you're making friends, taking in some serious historical sites and keeping out of fights for a bit. All good. Next stop Praha? Bet the riding's great as you get into Czech republic. Dark beer definitely is, and the original Budvar, not like that rubbish you used to like so much!